A gram of heroin can be bought for as little as £10 in Essex. After a long day at work many people enjoy a sociable pint in their local. With a £10 note you could buy two or three pints of beer and still get some change from the barman. But that £10 could also buy you Class A drugs on some streets of the UK. In areas of north Essex it is possible to buy a gram of heroin, which, depending on your body's reaction, could be enough for four hits of the drug. Colchester has been labelled "brown town" by local addicts because of how easy it is to get hold of heroin. The latest figures from the European Monitoring Centre for Drugs and Drug Addiction show the average street price for heroin is roughly £25-£40 per gram across the continent - four times more than the price you could get it in Colchester. One heroin addict, Ian, who lives in the town, told BBC Essex that the abundance of the drug had made it difficult to kick his habit. He said: "When you've been on heroin for 20 years and someone offers you in front of your face you can't say no, you can't stop it, you're so all over the place... it's everywhere." His girlfriend, Claire, who has been an addict for two and a half years, highlighted the same issue. She said: "A lot of people know I can get it if I want it, so a lot of people come up to me and ask me to get it, and so it's hard for me to stay off it." It is thought that the drug is brought to the streets of Colchester by organised gangs from London. As supply is higher than demand, dealers start with a low price to get people addicted. Once they are hooked the price is raised. Claudia Rubin, from drugs charity Release, said: "We're all enjoying cheaper strawberries because it's June - they're more available and they're cheaper in June than they are in December. Well for heroin it's always June." Drugs charities are also feeling the consequences of the low price of the drug. Katie Santos from Essex charity Open Road said she believed the price of heroin was directly linked to how much it is used. She said: "If people are using drugs and they can get them cheaper than a pint or cheaper than a meal than they're gonna use them. "It's a frightening situation in the sense that it can cause so much damage to people very quickly." 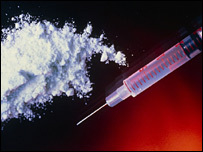 The reduced price of heroin in Colchester is said to reflect the general trend of the drugs market in the UK. As the drugs trade has become increasingly commercial and professional over the last 30 years, drugs have become easier and cheaper to import. As a result, more dealers enter the drugs market so supply outstrips demand and then prices drop to stay competitive. Ms Rubin said: "The price we're seeing now for a gram of heroin is... probably five or 10 times cheaper than the price of a gram of heroin in 1979. "All it shows is that the government and the authorities have absolutely no control over something as dangerous and volatile as heroin," she said. Release said addicts needed an improved rehabilitation system that did not focus on criminalising the user. If a heroin addict is caught in possession of the drug and given a criminal record it makes it difficult for them to integrate themselves back into society. They are prevented from applying for certain jobs, making it harder to become self sufficient. Ms Rubin said: "What we would always advocate was a health approach to dealing with addictions and drug use, and never the criminal approach." Release also suggested greater government intervention was needed, similar to the approach taken with alcohol and cigarette addiction. Ms Rubin said: "People are discouraged from drinking alcohol by huge public health campaigns - that's clearly a priority for the government and, of course, taxes, which help control the price. "You can reduce the harm caused by these highly addictive substances if you take a mature and grown-up public health approach and not purely relying on... throwing people in prison."